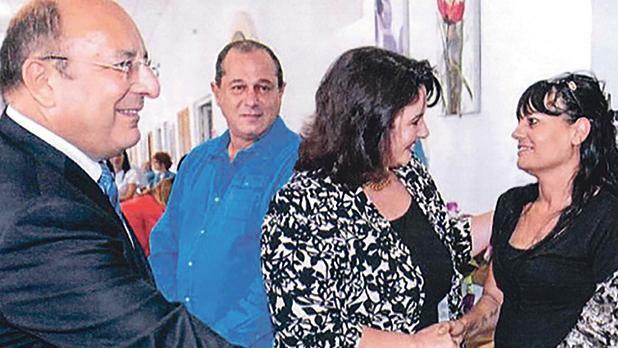 Denis Xuereb (in blue) accompanying Michael Farrugia, then family and social solidarity minister, during a visit to St Vincent De Paul Complex. A new tender for a multimillion-euro cleaning contract at St Vincent De Paul Complex raised eyebrows within the industry due to conditions that disqualify potential bidders, Times of Malta learnt. According to the specifications of the tender, issued last month after three years in the making, companies interested in offering their services must submit details of similar jobs they did over the past three years, which had a minimum turnover threshold to the value of “not less than €12 million”. Industry sources told the newspaper that, apart from the “very high” minimum threshold, meaning only a few local companies would be eligible, the call contrasted sharply with a similar one made only a few months ago but covering a much bigger operation, for Mater Dei Hospital. The Mater Dei tender, issued last year, set a “minimum value [of similar works] which must not be less than €1 million per annum for the quoted period”. The contract covered a period of three years. The industry sources pointed out that while the cleaning tender for the Luqa elderly people’s home, valued at less than €1.5 million a year until 2015, demanded a minimum previous works’ value threshold of €12 million from bidders, the Mater Dei contract, worth more than €6 million a year, was set at just €1 million. “This is either a mistake by those who drafted the specifications for the St Vincent de Paul job or it’s a way of excluding certain potential bidders to ensure some particular company is given an obvious advantage,” the industry sources said. Questioned about the evident anomaly, the director general for Contracts, Anthony Cachia, said that “the requested minimum value of services of similar nature, as part of the wider selection criteria, are set by the contracting authority [St Vincent de Paul Complex] and are duly published within the procurement documents. He noted that aggrieved economic operators worried about “potential playing field disparity” could make a pre-contractual complaint free of charge to the Public Contracts Review Board while the tender was still in the publication stage. He was also asked for details on the value of payments made to the cleaning contractor at the Luqa complex, who was selected without a call for tenders in 2015, but none were forthcoming. The last time a tender for cleaning services at St Vincent De Paul was issued was in 2011. When a new tender was due in 2015, the job was given to a newly-registered company, X-Clean Ltd, owned by Denis Xuereb from Naxxar, by direct order. The company was selected even before it was officially registered. The cleaning services at the old people’s home kept being awarded to the same supplier through repeat direct orders for more than three years. Documents show that Mr Xuereb also billed the government more than €300,000 a month for services unrelated to cleaning including engineering, hairdressing and gardening. Originally, the services were costing the government less than €100,000 a month. The Department of Contracts and the Finance Ministry, which are responsible for government procurement, defended the granting of multimillion-euro direct orders issued to X-Clean, insisting that was necessary until a new tender, which was being formulated, was issued. Insisting his department had only authorised the old people’s home administration to issue direct orders limited to cleaning, Mr Cachia said that the issue of a new tender was “a complicated” one that required time. Times of Malta is informed that X-Clean received about €9 million over the past three years from St Vincent De Paul, apart from being awarded other direct orders related to cleaning services at other government old people’s residences around the island. This happened when elderly people’s facilities fell under the political remit of Michael Farrugia, who is now Home Affairs Minister.